A table range also complements the chairs. The tubular steel table frame optionally comes withswivel castors and echoes the contours of the star base. The table shapes reflect the mix of anorganic form with clear geometries. There’s a choice of square, rectangular, round and ovalformats depending on usage, the number of places required and the size and characteristics ofthe room. 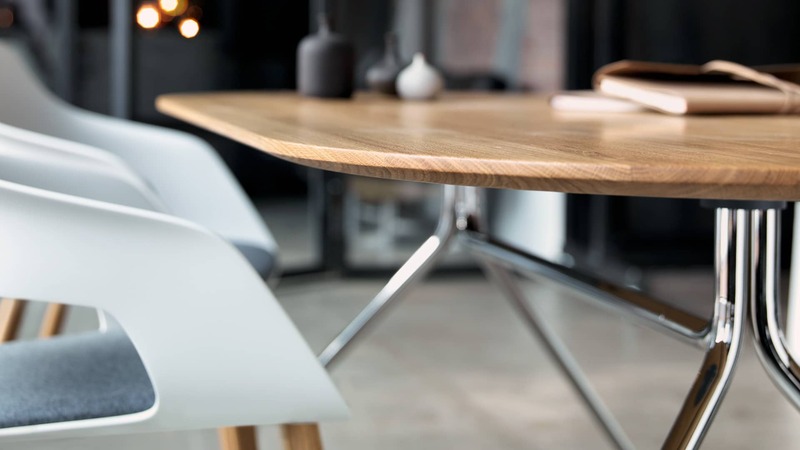 The table tops are available with bonded plywood surfaces, MDF panels with realwood veneers, through-dyed HPL (High Pressure Laminate) or solid oak panels.